In celebration of “soup month” February and all the cold, soup-worthy weather we’ve been having recently, here’s my contribution to Soup’s On at A Veggie Venture. It’s funny how much the texture of warm chickpeas can parallel that other vegetable commonly paired with leek in a soup–the potato. While leeks cook up insistently savory, the chickpea balances as a more neutral, slightly nutty accoutrement. Thinking more or less of hummous, a little cumin went into this, soft roasted garlic, a squirt of lemon juice for a tang of refreshment–and although this could very well have been left out, I did think that a small dose of sesame paste added an extra layer of character to the soup. 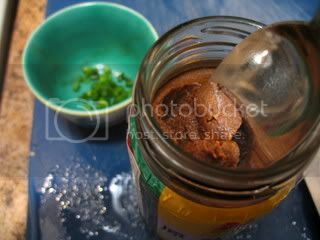 I should add that I didn’t have the Middle Eastern type of sesame paste, tahini, in my kitchen, but a jar of Chinese sesame taste, which is slightly sweeter, with a thicker consistency. Sesame can be a strong, overpowering presence so a tablespoon was all that was needed for a subtle, lurking note. A bright splash of herbs later, and I had a vegan soup that could be at once Middle Eastern, Italian (as many bean soups are), French, and Chinese. Weird, huh? I say easy does it when the blending the soup. For me it’s always an inviting contrast to come across a whole chickpea and taste its smooth, melt-in-your-mouth creaminess clear my palette a moment. 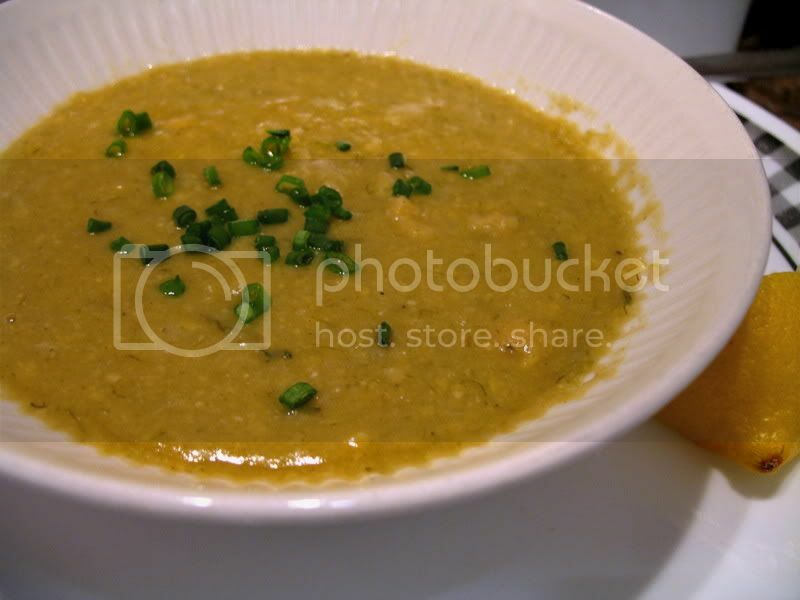 With the combination of spice and acid, I didn’t think this soup very comparable to a classic buttery potato leek (seen in one weeknight attempt on this blog), though I didn’t miss it for a second. Soup is on. Sodium warning–If I were making this soup the way I would have preferred I would have used dry beans and soaked them overnight. The fact of the matter is that I almost never do this because I don’t have the time, or I don’t think ahead enough or that I’m afraid a room-temperature pot of beans sitting around my apartment will go bad. So I buy canned ones. Goya canned ones, in fact, as they’re the most available brand in stores. And unless I chance across a store that stocks the reduced sodium cans, then I’m stuck with major sodiumization (360mg for a 15.5oz can of the chick peas), which means I have to add a little water and don’t get the pleasure of measuring out a little teaspoon or so of kosher or sea salt. Whatever. It’s never that much sodium that it can’t be fixed, especially with a recipe as elastic as soup. But it is something to keep in mind. 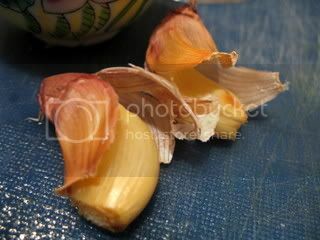 Roast garlic cloves and remove skins. Sweat leeks and olive oil under very low heat for about 10 minutes partially covered, stirring occasionally. Add chick peas and liquid from cans, and 1/2 cup water. Bring to a boil. Reduce heat to low, add spices and whole garlic cloves (will get blended up later), and let simmer covered for about 15 minutes or more. With a handheld blender or food processor, blend soup lightly until smooth, or to desired chunkiness. Stir in sesame paste and lemon juice. Taste for seasoning, cooking down if too watery or adding more water if too salty. 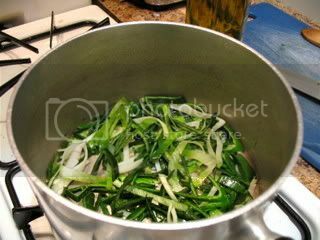 Serve with a sprinkle of chopped chives or other herbs. Three brownie points – the sodium issue mentioned above withstanding, this is a hefty, healthy little soup. Packed with proteins from the beans, this vegan delight draws on sesame paste and spices for flavor, but most of all, the fresh green leeks prevail. How simple is this, just leeks and chickpeas, really? But it looks and sounds delicious! Thanks so much for sharing it with everyone at Soup’s On! Hmm… I don’t think the food here meet my taste. I really like a bit of preserved lemon or Persian-style dried limes in lentil soups. Perhaps you could skip the sesame paste without much impact… it does more for the flavor of things like falafel or hummus. I have to say I’ve occasionally found myself with a similar soup on nights when I am not really sure if I wanted a kind of Greek-style, Lebanese-style, or Indian-style lentil soup, and then I somehow use something from each corner of my spice board. Tomatoes also like lentils. Or is that the other way around? Ah, I might sound a little brain-dead conflating lentils and chickpeas… though in a soup, they tend to work out to like pretty much the same things. Your pictures look really lovely! I appreciate the effort you put into them. 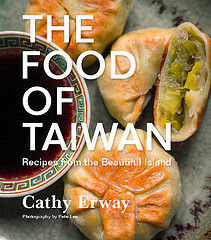 Oh I will have to try this, never occured to me to use chickpeas (I did the old potato-leek for Soups On). Looks great. hi, I just found your chickpea [=chick pea] leek soup recipe and your website and enjoyed reading your mission statement and about pages. I don’t know how I could have escaped learning about such a soup combination since I have been eating Lebanese food for over 17 years (my mother-in-law/wife influence). I will have to browse through your other pages. One of the highest quality weblogs I’ve come across for details in this specific specialized niche. I am going to often be checking back consistently for brand-new articles. Fuzzy Threads, LLC "All your pet needs" /"Get your fuzz on!" I came across this recipe and used it as a starting point yesterday. How good was it? This is the first comment I’ve ever left on a recipe in all the decades I’ve been cooking. I swapped out the lemon juice for some freshly ground sumac, used dried chickpeas, roasted my cumin before grinding it, increased the sumac, roasted cumin, and dried thyme amounts, and used tahini to keep my Lebanese theme.